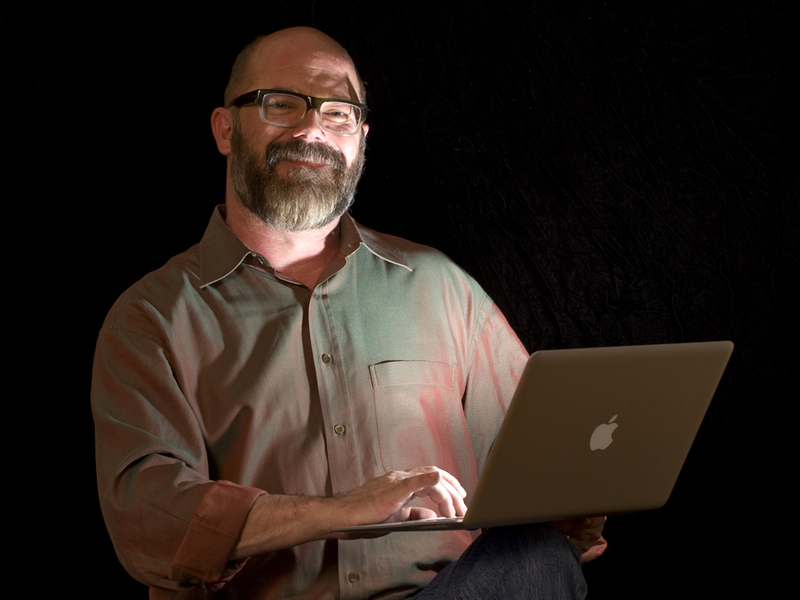 See videos of some of Andrew Sullivan's television appearances. It was noon in Washington, D.C., when the shooting began in Tucson. Across the country, reporters and media executives rushed to cover the story of the gunman, the Congresswoman he shot at close range, and the 14 other victims. But the news couldn’t reach one of the Internet’s most important writers. For Andrew Sullivan, M.P.A. ’86, Ph.D. ’90, the editor of a blog called The Dish, the weekend is a time for rest, and having teed up on Friday afternoon a half-dozen evergreen posts for Saturday, he had turned off his communication devices and was sleeping in. Sullivan had been lightly ill that week, so he slept unusually late, until almost two in the afternoon. Before he was quite ready to deal with the world, he checked his mailbox—and woke up fast. Along with the news of the shooting was an urgent question from readers: Andrew, where are you? Sullivan winced. He e-mailed his four young assistants: “We have to go cable”—that is, pump out blog posts 24/7. Then he climbed four unpainted wooden steps to what anyone else would call a large windowed closet and he calls “the blog cave.” He pulled a velvet curtain shut to seal himself off from his husband and their beagles, settled into an armchair with his laptop, and began a siege of blogging that would last six days. Sullivan and his team had worked like this before. During the 2010 protests in Iran, they had scoured Facebook messages, Twitter bleats, Al Jazeera dispatches, and Iranian blog posts. The eclectic charm of the Dish (formerly TheDailyDish)—poems, philosophical and religious speculation, photographs from the windows of readers, the latest Sarah Palin outrage, and videos by The Pet Shop Boys—disappeared. The site became all Iran, all the time, and the Dish quickly became the Web’s go-to site for news and context. In the process, the site’s traffic spiked. The Dish’s coverage of the Tucson shootings paralleled its Iran coverage. While other bloggers ascribed blame, Sullivan filtered new reports, asked important questions, grieved for the victims—and avoided partisan speculation. Once again, his audience grew. But this round of blogging was different. Andrew Sullivan is a lifelong asthma sufferer. He has sleep apnea, and at night wears a mask connected to a machine that regulates his breathing. And since 1993, he has been HIV-positive. Although Sullivan isn’t the only writer with HIV to have survived for almost two decades, no other HIV-positive writer publishes anything like 300 blog posts a week, year after year; he needs to monitor his health. When Sullivan returned, he had news of his own—he was leaving the Atlantic website, his home for the last four years, to join TheDailyBeast.com and Newsweek magazine, both edited by Tina Brown. In the traditional media paradigm, it’s a promotion for a writer to move from the website of a highbrow monthly magazine like the Atlantic (circulation: 400,000) and the occasional article for that publication to America’s second-largest weekly news magazine (circulation: 1.5 million) that has just become the partner of a website with five million monthly readers. But when the writer in question has a blog that’s more popular than the websites of many publications, it’s clear that Newsweek/Beast got something equally important in this deal. 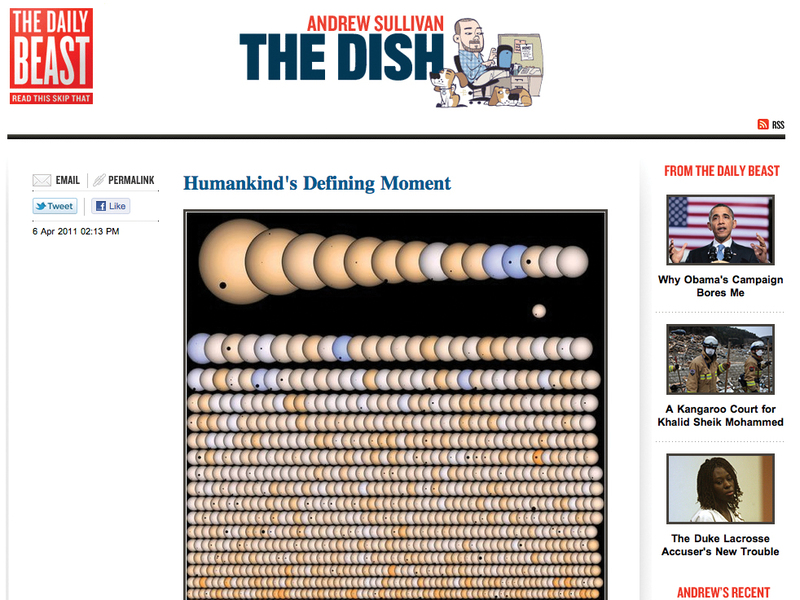 “The Dish has twice as many readers as the New Republic and more than National Review,” Sullivan says. And on the Atlantic site, the Dish also ruled. Some days, according to Alexa.com, which measures site traffic on the Internet, the Daily Dish accounted for more than half of the visitors to TheAtlantic.com. In cold numbers: Andrew Sullivan—one blogger, with a small budget and a minimal staff—has presented Tina Brown with a gift of about 1.3 million Internet readers. American media have three castes. At the top is “The Village,” a term created by a progressive blogger who calls herself “Digby” to describe a rarefied league of highly paid bold-faced names—think David Brooks, Peggy Noonan, Howard Kurtz—who move easily between print columns and television punditry. In the middle is the working press, a stressed-out group of reporters and columnists employed by increasingly desperate newspapers and magazines; to their daily tasks has been added blogging on their publications’ websites. At the bottom are bloggers. Most of the Internet’s 150 million blogs serve up highly personal dispatches, the equivalent of those year-end letters that arrive in Christmas cards. Very few of those bloggers post news and views as a primary activity—there’s no money in it. So blogging as a professional journalistic activity really involves at most a few thousand independent writers. These elite bloggers are serious and knowledgeable, but they are often described as the untouchables of American media—unemployed, unemployable pajama-clad slackers who live with their parents and tap out overwrought screeds on basement computers. That view is not the verdict of critics who have visited the sites of elite bloggers; it’s a media god’s throwaway line. (NBC News anchor Brian Williams, for example: “All of my life, developing credentials to cover my field of work, and now I’m up against a guy named Vinny in an efficiency apartment in the Bronx who hasn’t left the efficiency apartment in two years.”) Beyond a general disdain for the Internet, the reason is often personal—bloggers don’t just write about politicians, they also attack the media. And because media potentates don’t welcome criticism, they lash back. Andrew Sullivan also moves easily from blogging and print journalism to TV, but his resemblance to the Villagers ends there. For one thing, his views are ever-changing and all over the map; a TV producer can’t count on him to speak for any one constituency. For another, although he has a résumé that qualifies him as a media elitist, he has dramatically redefined his idea of success. At 47, his concerns are no longer those of the overachieving wonder boy he used to be. Sullivan earned a first-class degree (equivalent to a summa) in modern history and modern languages at Oxford, where, in his second year, he was president of the Oxford Union, the debating body that claims to be “the most illustrious student society in the world.” He won a Harkness Fellowship to the Kennedy School in 1984; back in London, he interned at the think tank of one of his idols, Margaret Thatcher. He returned to Harvard in 1989 to write his doctoral thesis, “Intimations Pursued: The Voice of Practice in the Conversation of Michael Oakeshott,” which won the government department’s Toppan Prize, for the best dissertation “upon a subject of Political Science.” In 1991, when he was just 27, he was named editor of the New Republic; under his leadership, the magazine grew impressively in both circulation and advertising. He left the New Republic five years later, “at the tail end of a series of differences,” says New Republic owner Martin Peretz, Ph.D. ’66. Sullivan moved on to write books and become a contributing writer for the New York Times Magazine and a columnist for the Sunday Times (of London). To see such precocity is to be mystified—why would a writer with such impeccable credentials cast his lot more with bloggers than with people of his own kind? At 11, he commuted three hours a day to attend a school for gifted boys. His protection was his Roman Catholic faith. He’d been an altar boy; now he drew crosses in the margins of his books “to ward off evil” and, in art class, refused to draw anything unrelated to the Bible. 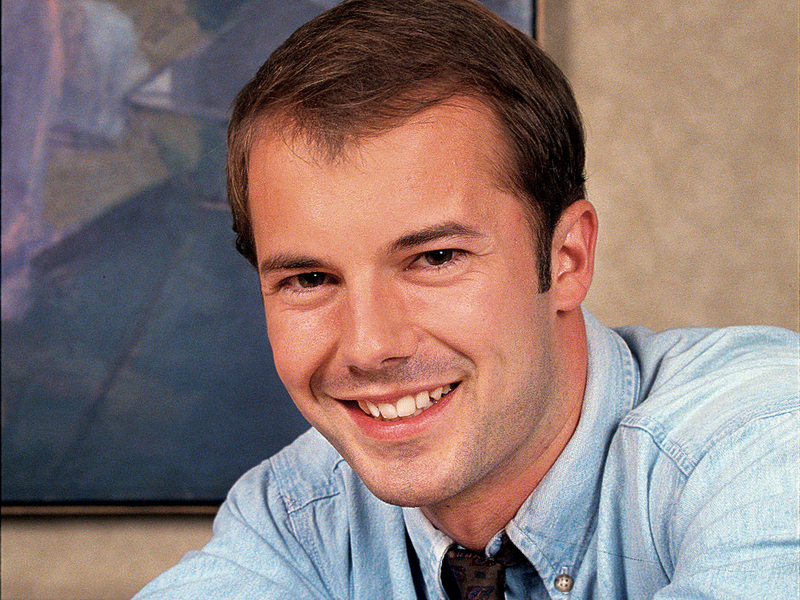 His ambition could not have been more conventional—to become a Tory member of Parliament. That is classic Sullivan: the unsparing candor, the over-sharing, the spiritual afterthought. Three years later, when he started to blog, that kind of writing would become his signature—and, for all its outsider status, the first really comfortable identity he’d known. When Sullivan launched a website in 2000, he thought of it as nothing more than an archive of his magazine articles. He knew nothing about technology—every time he wanted to add another article, he had to ask a friend for help. Sullivan is a prolific writer; for his friend, this routine quickly grew old. “Do it yourself,” he advised. Self-publishing was liberating. Under a “Daily Dish” headline, Sullivan started adding short posts. Readers sent suggestions. Soon he was updating his site several times a day; if a blogger is defined as a single writer who regularly posts news and commentary, Sullivan was among the first. And, from the beginning, he was popular; within a year, his request for contributions brought in $27,000. Toppling a dictator in Iraq did. Sullivan was committed to that idea—even more committed, he says, than his friend Donald Rumsfeld. Sullivan’s Catholicism didn’t allow for situational morality. Neither did his boyhood hero, George Orwell. He had made a mistake—“the darkest political misjudgment of my life.” Now he had to pay for it, and because he was a blogger, he had to pay in public. The institutions that Sullivan believed in disappointed him so greatly during the Bush administration that in 2004, for the first time, he endorsed a Democrat for president. “I’ve met so many gay soldiers I wasn’t aware there were any straight people in the military,” he says, deadpan, but official recognition of gays in the armed forces made no headway in those years. In the ’90s, long before most gay men thought gay marriage was a possibility, Sullivan had been an activist in that cause; he was furious when the president advocated a constitutional amendment defining marriage as a heterosexual partnership only. And as a fiscal conservative, he disagreed with the Bush administration’s enthusiasm for off-the-books funding of expensive wars and medical programs. Andrew Sullivan did not support John McCain in 2008. The torture flip-flop would have been enough of a reason. Then McCain added Sarah Palin to the ticket. The combination of her scant government experience and “raw political talent” terrified Sullivan—and with only two months between her nomination and the election, he started hammering. Unsurprisingly, he has provoked others to respond in kind. Sullivan doesn’t just criticize. He proposes solutions. He dreams of a Republican candidate who is “a real fiscal conservative, socially inclusive, open to serious tax reform and politically adult conversation to regain the center ground.” Currently he is extremely enamored of Indiana’s Republican governor, Mitch Daniels, who is not, as of this writing, a presidential candidate. He wasn’t. Sullivan and Bradley had their differences about money—the Dish may have accounted for as much as $2 million in advertising revenue each year, and Sullivan has long wanted a cut—but Bradley says he was quite willing to share equity. The catch: Sullivan would have to broaden the site, so its success didn’t depend only on him. But in the end, the issue really was Sullivan’s innate restlessness. In 2007, the short blogger and the tall actor got married in Provincetown, where they spend two weeks each summer, to get off the grid. The rest of the year, they live with two beagles in the large studio apartment that Sullivan bought in 2000 with his profits from day trading. It’s a quiet life; their biggest social event is usually their weekly hosting of the new South Park episode. In 2005, an exhausted Sullivan thought he needed to quit the Dish. When he thought that again in 2010, the hiring of assistants changed his mind. Now there seems to be nothing that makes him dream of slowing down. Andrew Sullivan is an intellectual diva, prone to epic battles. He’s a showman; call what he does a show. But he performs in the open, without rehearsals, and he reveals everything to his readers, never sparing himself. And then, because he has an acute sense of pacing, he varies his posts with features that have nothing to do with politics, torture, or Palin. 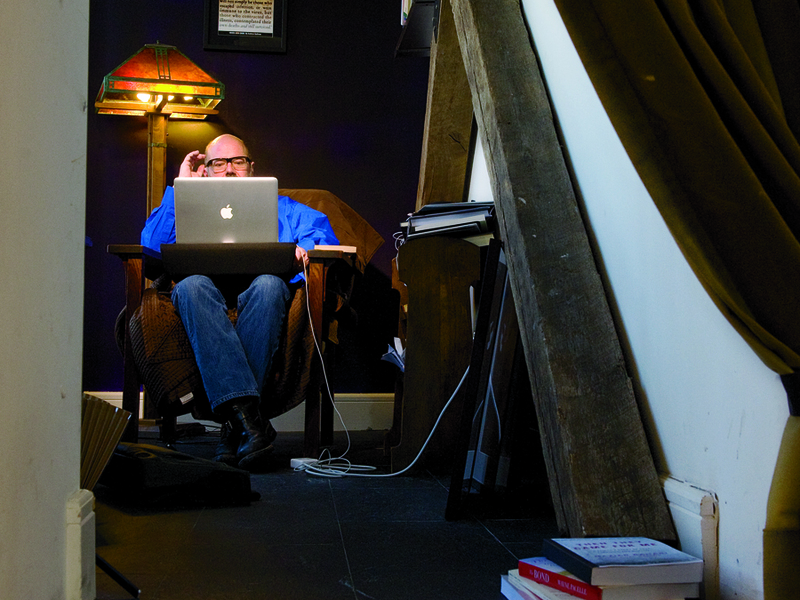 Jesse Kornbluth ’68, a New York-based writer, edits HeadButler.com.